Originally published on BBH Labs. Certain artists are typecast, sometimes by choice. They capture a style so well that it comes to define them. Author Jonathan Safran Foer falls outside of that camp with a chameleonic thud. He keeps us curious. In his new book, Tree of Codes, Foer does with a physical book what we often neglect in digital—he turns reading into an experience. In showing how a story’s environment affects its meaning, he gives digital storytellers a slap in the face. It creates a new story by tearing apart and piecing together an old one—Bruno Schulz’s The Street of Crocodiles. 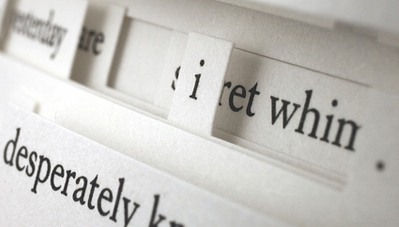 Each page is die-cut to reveal just a handful of words and phrases. I found the book annoying to read at first, despite its delicate beauty. I couldn’t decipher between the page I was reading and the ones beneath it. It was like a depth perception test following a mug of bourbon. After sobering up and finding a better technique, I enjoyed the layout. Words hovered in a dream-ridden state. Thought went into each line, each phrase and how it was laid out. Such attention to the UX of reading is tough to find on the web. Foer’s analog approach would be easy enough to toy with in digital. So why aren’t we more playful with narratives online? Brilliant writing isn’t enough to keep readers happy. Long blocks of copy, no matter how poetic, are begging for attention spans to scamper off elsewhere. In a design dominant field, it’s easy to neglect voice, tone, even punctuation. Or to forget about how each will figure into a broader environment. Maybe that’s because we get swept up in technology. We use it to tell stories rather than to shape them. The following ideas and executions use technology to influence how stories are read. Bravo! The better ones put UX at the forefront. In doing so, they offer some lessons in communicating creatively. We Tell Stories: Bring physical location into the narrative. Telescopic Text: Let the reader decide what information to absorb. The Sweet Old Etcetera: Make static literature kinetic. There are lots more eLiterature exampleshere. Open Bookmarks: Consider the selfish benefits to social reading. Ben the Bodyguard: Communicate utility via a character. These concepts and methods fool with language, narrative and technology to entertain. It’s humbling to think that a few pieces of paper and an X-Acto knife can do the same. When we leave room for interpretation and delight, we can expand the playground for digital fiction. We can turn stories into experiences that are unique to each reader. So let’s stop neglecting the goddamn words. Pretty please?